December 6, 2016 2016 presidential campaign, 2016 presidential campaign, Dollar, Economy, Hillary Clinton, oil, Politics, President, Stimulus, stock market, Trump, Wall St. The elite made a monkey of Trump before the election. But since then he’s released the stock market’s animal spirits. 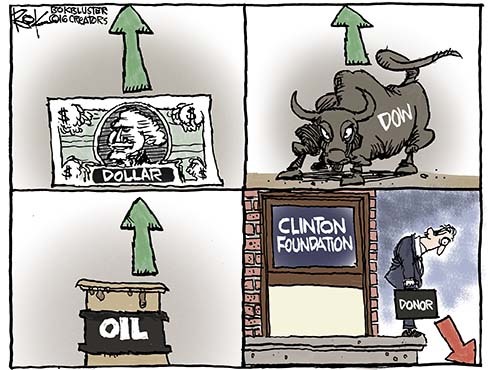 Oil and the dollar dig The Donald too. Many 401-k investors are bullish because stocks have hit record highs. But Clinton Foundation investors – not so much. Well, at least one Clinton supporter has done ok. Warren Buffett’s Berkshire Hathaway is up 8% since the election.